Below are answers to questions we often get asked by parents new to the Dragons. If you can’t find what you are looking for, please feel free to e-mail . How do I get started with the Dragons? Dragons offers lacrosse for boys and girls in grades 2 through 12 at ANY skill level. The best time to get started is either our summer camp or Fall Training in September through November. At Fall Training we conduct beginner and intermediate skill sessions for all age levels. Most players enter the sport in grades 2 through 4, but Fall Training makes it possible for older players in 6th, 7th or 8th to pick up a stick and get started. And, Fall Training naturally progresses into our Winter Local Season, which allows a new player to join a team and get some competitive experience. If you are a new player and would like to join in the Spring with limited or no prior experience, we recommend a few lessons with a coach before we place you on an entry level team. What if I don't have equipment? Starting in September of 2016 we will be offering free loaner gear to new players. Here is how it works. Once you have registered for a program, simply contact to reserve a set of gear. The gear will be brought to the field at the first session, and will be handed to you in exchange for a $100 deposit check. The deposit will be handed back to you when you return the gear. What if I am not sure about lacrosse and just want to give it a try? We offer a free session and free loaner gear to any new player that would like to try lacrosse before committing to a program. Simply contact to set up your free session. Can I register my player for multiple programs in the fall? In the fall we run box lacrosse and the fall training sessions concurrently. If you wish to do so, you can sign your player up for both. We have an excellent coaching staff. A list of bios can be seen on the COACHES PAGE. How do I contact coaches? Contact information for each of our coaches is on our CONTACT PAGE. Where can I see the schedule? When we are in season, you can see the all our activities listed on our MASTER SCHEDULE PAGE. You can also download the Dragons App for Android and iOS. More info is HERE. Please be careful when you use the app to make sure you refresh it every time you use it so you have the most current information. It does not update itself. Does my player’s team have its own page? Each team has a team page on our website. The team page tells you who the primary contact is for things such as absences and other notifications. 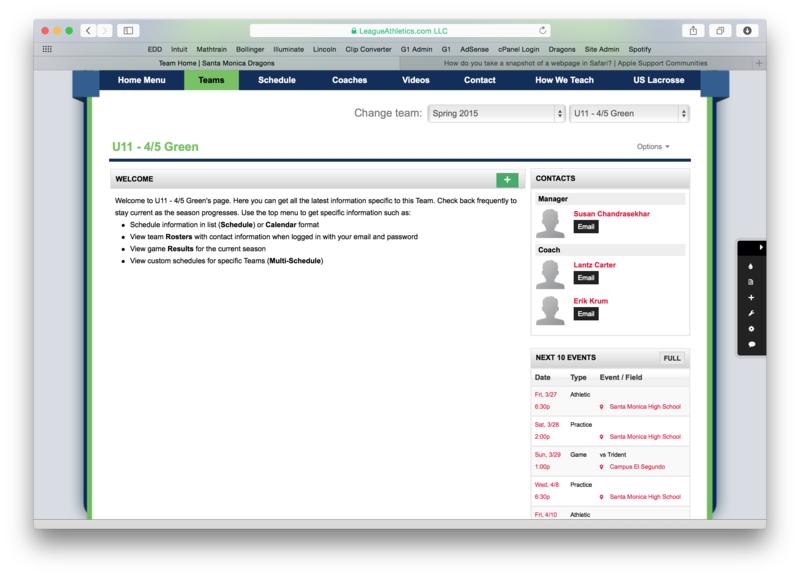 It also allows you access to the teams roster (password controlled). And it shows you the schedule for just that team. Team pages can be found HERE. 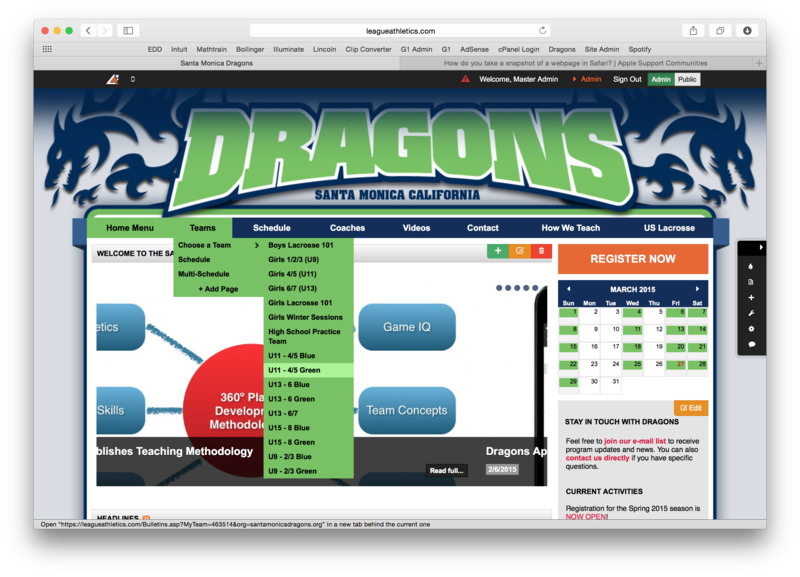 To access a specific team, use the pull-down menu in the upper right that says “select team” and select your team. How Do I View A Team Roster? Rosters are not viewable to the public, so you need to log in in order to be able to see them. 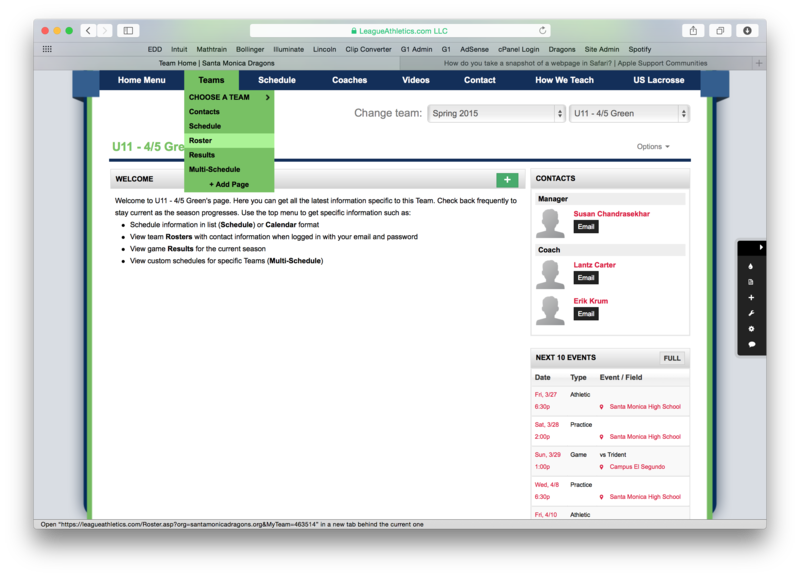 Once you are logged in, click on “Teams” in the horizontal menu bar. This opens a new menu in which you select your “season” and the specific team. You are now on the team page for that specific team. This page is the gateway to see the roster and the schedule for that team. Once you are on the team page, you can click on “Teams” again, and it generates a new menu that shows the “Roster” option. Click on “Roster” and it will generate a new page displaying the roster for that team.